With our ever-growing needs for electricity and our consumption habits, night time is not like what it was a few decades ago. Now our cities are as illuminated as in the middle of the day. 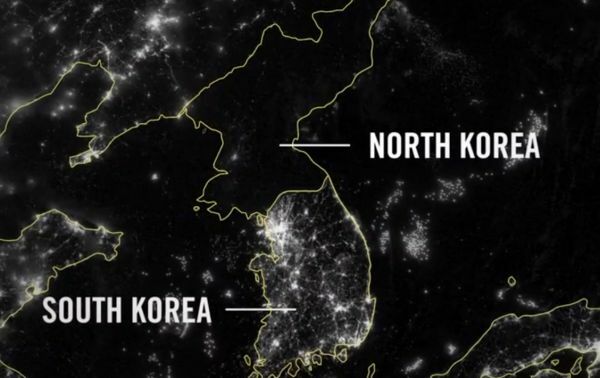 Hence the astonishment in discovering this photograph of North Korea plunged into complete darkness. How can we explain the total blackness of this country of 25 million inhabitants? In a few words, the legacy of the Kim Dynasty. Pyongyang, the capital of North Korea (DPRK), offers the surreal spectacle of immense, endless and wide arteries definitely devoid of any traffic, lined with sinister gray buildings and soulless. There are few people in the streets of this capital. Where are the shops? The crowd, the frenzy that one observes in all Asian cities? One symbol: The Ryugyong Hotel, a sort of stylized Russian mountain that had to peak at 330 meters and offer 360,000 square meters on 105 floors has long offered the spectacle of a desolate concrete blockhouse structure. Started in 1987, the construction was stopped in 1992 due to frequent power cuts as the government was going through a lot of financial hardship. It was during these same years that North Korea went through a severe famine. How is this possible in a country where resources abound? The industrialization of Korea has essentially served to over-militarize the country. The figures are eloquent: first army in the world in number of military per thousand inhabitants and fifth army in the world in terms of numbers. Moreover, DPRK is now the 9th state to possess nuclear weapons, which raises the concern of the international community. On the agricultural side, the picture is even more dramatic. North Korea has gone through a series of appalling natural disasters: floods and droughts, but aggravated by the implementation of agrarian reforms in Moscow: massive deforestation, intensive agriculture have washed out and deeply impoverished the soil. To obtain oil at preferential tariffs, North Korea had to trade agricultural commodities. Its situation deteriorated further after the collapse of the USSR. Russia naturally stopped the financial aid provided to the people’s republics during the communist era. With a mineral resource estimated at 24 times that of South Korea, the DPRK has a major economic asset, particularly with a view to the reunification of the peninsula, since it would restore complementarity between the North (where most of the heavy industries were located in 1945) and the South, which traditionally harbors the best agricultural land. According to the Bank of South Korea, the mining sector accounted for 8.7% of the DPRK’s gross domestic product in 2004: if energy resources (coal) are the main resource in mining production, North Korea is also rich in several strategic minerals: its reserves of magnesite, tungsten, graphite (2006 production: 32,000 tons, 6% of world reserves), gold (2006 production: 2 tons) and molybdenum (ores) place the DPRK in the first rank worldwide. The North Korean subsoil also contains tungsten, mercury, phosphates, silver, fluorine, titanium and molybdenum. North Korea is second country in the world (after China) for magnesite reserves, estimated at 490 million tons. Annual production of magnesite (10% of the world total) ranks North Korea third in the world. In addition, there are offshore oil reserves, not exploited, in the Western Sea, whose location straddles the Chinese and North Korean maritime areas. Coal production (mainly anthracite, with reserves estimated at 1.8 billion tones), or 23 million tones per year, is allocated in 600 mines. It is concentrated in the areas of Kaechon, Pukchang, Sunchon, and Tockchon, in South Pyongan, and Saebyol in North Hamgyong. Some of the production is exported to China (2.27 million tones in January-December 2005, accounting for nearly 10% of China’s coal imports). Early to mid-1960s the north Korean economy actually outpaced that of South Korea. During this time both sides of the Cold War were pouring aid into both countries in an attempt to show that their system was superior. South Korea grew fast, but North Korea held its own. Iron resources in 1970 had made the North Korean iron and steel industry the fourth most powerful in Asia, after Japan, China and India. At the end of the 1980s, the extension of the Kim Chaek Iron and Steel Complex had raised the annual steel production to 7 million tons. If energy shortages subsequently affected production capacity, they tend to be restored: in 2007, steel production was estimated at 1.23 million tones (up 16% from 2004) but decreased to 1.079 million tones in 2015. Iron production (5 million tons in 2005) places the DPR Korea at 18th place worldwide. Copper is produced mainly in the Musan mine (North Hamgyong), the largest in Asia (its reserves are estimated at between 3 and 7 billion tons), which also produces iron, and the Unryul mine (South Hwanghae). Copper ore production amounted to 4.91 million tones in 2005 (of which 1 million tones were exported to China in 2005, compared to 600,000 tones in 2004) and 5.13 million tones in 2007. In the case of non-ferrous metals, other production (zinc: production 2006 67,000 tons, lead: production 20,000 tons 2006) is produced in the Komdok mine (South Hamgyong) and refined in Mungyong. Production of fluoride (12,000 tons) ranks North Korea fifteenth in the world. Given North-South complementarity in the mining sector, this sector has given rise to several inter-Korean projects, carried out on the South side by the state-owned Korea Resources Corporation (KORES), in particular for the exploitation of graphite. The mining resources of the DPRK are also being developed in partnership with foreign countries, with China and Germany among others, in particular to modernize production structures. In 2005, a Sino-North Korean agreement (between the Chinese Metal Mining Company and the DPRK Ministry of Foreign Trade) was the first in the mining sector outside of a special economic zone. Anthracite mines in Yongtung, whose annual production amounts to 1 million tons. On December 12, 2008, an agreement in the coal and chemical industry was signed between China and North Korea. It is difficult for foreign investors to participate in the management of joint companies with North Korea. Foreign investors want to establish their own companies and operate the mines. The rights of investors to ownership, exports, and other key business arrangements related to the North Korea mining industry are unclear. North Korea is not forthcoming about its mining projects and will not provide information without prior investment agreements with foreign companies. As of March of this year, North Korea has expanded its oil import capacity as Washington seeks to tighten sanctions on its nuclear and ballistic missile programs. The expansion of the oil terminal in Nampo, a port city on the west coast of North Korea, has been under way since October 2015. The report is based on satellite images taken on October 4, 2015, and again on October 4, 2016. It seems that North Korea has built a second wharf at the oil terminal and the dry land between the two docks should be used for a new oil terminal and storage facilities. North Korea imports 90% of its energy from China and crude oil is considered a vital link for the army and economy of Pyongyang. Ed Royce, chairman of the Foreign Affairs Committee of the US House of Representatives, introduced in March new legislation to significantly strengthen sanctions against North Korea, including sanctions against those supplying crude oil and other products related to the North. Seoul welcomed the legislation by saying it could be a “strong message” to exert “tangible pressure” on North Korea. According to Chinese Customs data, in the first quarter of 2017, imports from China to North Korea increased by 18.4% compared to the same period of last year, while its exports to North Korea increased by 54.5%. From January to March 2017, China’s trade with North Korea amounted to 8.4 billion yuan (1.15 billion euros). China’s trade surplus with North Korea reached 1.52 billion yuan (208 million euros)—an increase of 37.4%. From 19 February, China suspended imports of North Korean coal. It did not import it at all in March. As a result, in the first quarter of 2017, coal imports from North Korea were only half of what they were a year ago. According to Reuters, following the implementation of this suspension, Beijing ordered commercial companies to return the cargo of coal from North Korea. As North Korea reach out to new friends late April, it urged Algeria to help it exploit its oil. This is what justifies the visit in the Algerian capital of Sin Hong Chol, the deputy North Korean Minister of Foreign Affairs. The official proposed to the Algerian authorities to look at the opportunities offered by his country, particularly in the field of exploration. It was also an opportunity for the official to call for the strengthening of energy cooperation between the two countries, while highlighting his country’s skills in the field of hydrocarbon processing. With a total embargo on oil imports because of its nuclear tests, North Korea could, if indeed it received the aid of Algeria, develop a solid hydrocarbon industry in order to emancipate itself from this blockade. According to the Energy Information Administration (EIA), as of July 2015, North Korea has no proven oil reserves or petroleum and other liquids production. During North Korea’s industrial peak in the 1970’s and 1980’s, the country was able to import oil from China and the Soviet Union at below market prices. Following the end of the Cold War, these deals ended, and North Korea’s oil consumption dropped from 76,000 barrels per day (b/d) in 1991 to 17,000 b/d in 2013. It is difficult to get an exact estimate of the amount of oil imported into North Korea each year, states the EIA. Some estimates report that North Korea imports more than half of its oil from China and some volumes from Russia. North Korea has the capacity to refine 64 thousand barrels a day, however as a result of the economic decline, has utilization rates below 20 percent. Despite this, North Korea is able to refine enough crude oil to meet some of their domestic demand. Patricia Schouker is an energy analyst based in Washington DC and an Associate Member of New College at Oxford University. Twitter: @Patricia_Energy.